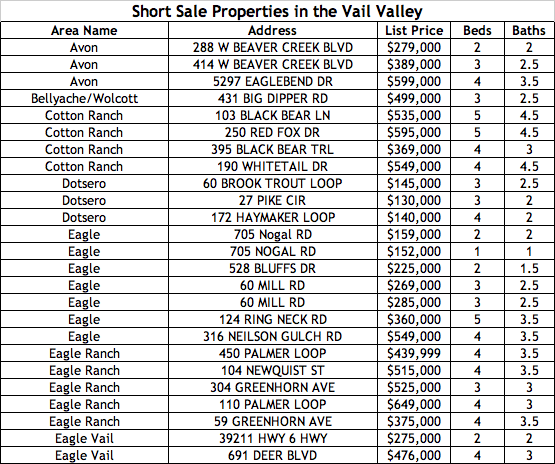 Vail, Colorado Real Estate Spotlight: Eagle-Vail! Comprised mostly of residential properties, there?is also a great mix of commercial enterprises in Eagle-Vail, providng for a true mountain?neighborhood experience.? An excellent public golf course meanders its way throughout the community, as does the Eagle River.? ?With?an excellent mix of?local residents and second homeowners, Eagle-Vail continues to be a vibrant and exciting place to live. Please click on the links below to view 2 amazing values?in Eagle-Vail. 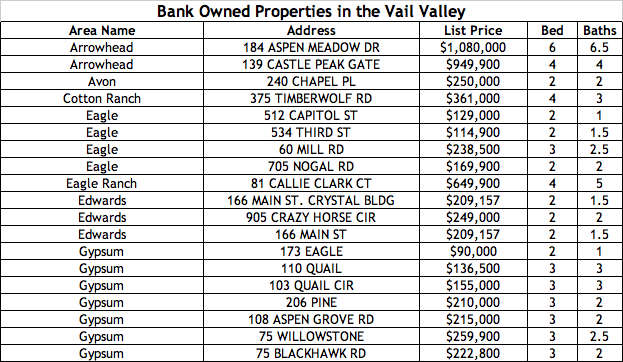 Read more about Vail, Colorado Real Estate Spotlight: Eagle-Vail! Screamin' Deals in the Vail Valley this Week! Read more about Screamin' Deals in the Vail Valley this Week! Floor to vaulted ceiling windows makes this home bright and airy. Remodelled Duplex Coming Soon in Eagle-Vail! Coming soon to Eagle-Vail; 1282 Deer Blvd Unit B!!? This 1/2 duplex with great views is currently being remodelled and should be listed in early August 2008.? Call now for the inside scoop and to?take a look before it hits the market. Backing to a wooded hillside that will never be developed, this mountain home offers privacy, convenience, and great living spaces.? The main living?room has 2 sitting areas and a deck capturing the big views to the north.? The kitchen faces the green of the treed back yard and the attached dining room with a large bay window. The top floor has both a large master bedroom with a new walk-in closet, and a large secondary bedroom.? Both top floor bedrooms have brand new bathrooms and have their own private decks.? The lower level consists of a smaller bedroom with its own bathroom, perfect as an office or guest bedroom.? And the attached 2 car garage has a huge work bench and tons of storage. Read more about Remodelled Duplex Coming Soon in Eagle-Vail! Another Price Reduction in Avon,CO! The Seller Wants to Sell!? We hear this all the time, but the seller of 3000 Eaglebend #10 in Avon, CO means it!? Originally listed at $895,000 (due to the sale of a similar neighboring home selling for $840,000 in August of 2007) this amazingly remodelled single family home is now priced at $780,000!? Instant equity as they say! Located on the Eagle River, with private river access, this enclave of beautiful homes lies between Vail and Beaver Creek Resorts.? Fly fish just steps from your 3 level, designer finished home.? Keep your toys in the one car garage!? All of this and more in an upvalley location. NOW is the time as the seller is considering a long term rental. Please contact me to learn more about this great opportunity. Read more about Another Price Reduction in Avon,CO! Stonebridge Enclave #10 Sees HUGE Price Reduction! Over $100K!? That is the amount of the recent price reductions on 3000 Eaglebend Dr. #10, a wonderful?single family home on the Eagle River.? Located between the communities of Avon and Eagle-Vail, this upvalley location is close to the slopes for both Beaver Creek and Vail.? And it sits right on the Eagle River, with private Eagle River access for all homeowners in this cozy enclave. The master bathroom (pictured above) is typical of the superior upgrades and finishes that exist in this spacious 3 bedroom home. To learn more about this awesome property in the heart of the Vail Valley, please contact Hank Sender at (970)376-7857 or myself anytime. Read more about Stonebridge Enclave #10 Sees HUGE Price Reduction! 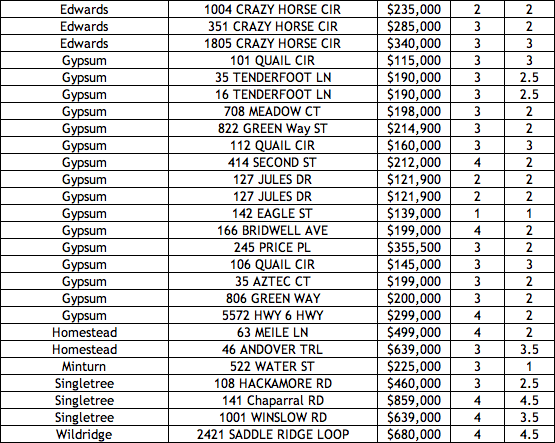 The selllers of 376 Eagle Rd. Unit D in Eagle-Vail want to SELL!? They have just reduced the price to $498,000; that's a 5.5% reduction!? This 3 bedroom/2.5 bathroom upvalley condo is now a really GREAT BUY! With a 2 car garage, a separate office, open living spaces, and privacy, this well maintained condo is perfect for both locals and tourists alike. All this for under half a million $! Please contact me anytime to discuss this great property. Read more about Eagle-Vail Price Reduction! !